In the wake of a public death by suicide on campus last night, students are demanding urgent attention to mental health at the University of Toronto. Approximately 100 students gathered outside Simcoe Hall on Monday afternoon, meeting what they perceive as silence from the university administration on mental health with their own solemn silence. Toronto emergency services were called to the Bahen Centre for Information Technology on Sunday night in response to a medical emergency, after a student fell from high in the building’s atrium. Toronto Police have ruled the death to be non-suspicious and non-criminal. This marks the second death by suicide in the past year at the Bahen Centre, a hub for students studying computer science and engineering at U of T.
Congregating outside Simcoe Hall at 2:00 pm, the protest grew in numbers until shortly after 3:00 pm, when students moved inside to sit on the second floor of the administration building. Students were seen holding signs with slogans including “the university is complicit” and “you can’t ignore us forever.” A number of media outlets, including CBC and CTV, were also present. By 5:00 pm, students had moved across King’s College Circle to the Medical Sciences Building, where a Governing Council Business Board meeting was taking place. The Business Board meeting was originally scheduled to take place at Simcoe Hall, but the location was changed on short notice. Padraic Berting, a third-year student, was one of the organizers of the protest. “This is an issue that’s very personal to me,” Berting said, noting that this was the third death by suicide on campus in the past year that he was aware of. The two deaths at Bahen are inseparable from the computer science student community. The intense pressure that computer science students are put under, both to be accepted to the subject program of study and succeed in the competitive program, have a number of people questioning how it may contribute to poor mental health. “I think that there’s ways that the program is more stressful than it has to be,” said Maxwell Garrett, a second-year Computer Science student who was at the protest. Garrett is saddened by the deaths in Bahen, a space in which he and many others in the computer science program spend much of their time. “It’s a little stressful, just knowing that two students have ended their life there,” Garrett said. Anam Alvi, a fourth-year Computer Science student present at the protest, was studying in Bahen last night when the death occurred. Alvi came out to the protest because she wants to put pressure on the university to recognize that “people aren’t okay with this lack of acknowledgement and lack of action,” even if it means hurting the reputation of the university. Janine Robb, Executive Director of the Health & Wellness Centre at U of T, said that the centre had been working hard to provide support to students impacted by the recent death, including accepting short-notice appointments and bringing in an outside provider to be on campus today for extra support. Robb acknowledged the “tragic accident” that occurred at Bahen and reiterated that the university is unable to share any more details at this time because the victim’s family has not provided permission for the university to do so. “We’re really focused more on students who witnessed or who are affected by what happened,” Robb said. “To me it seems we’re never seen as supportive enough, despite our best efforts, and I’m just not sure how to change the dialogue on that,” Robb said. 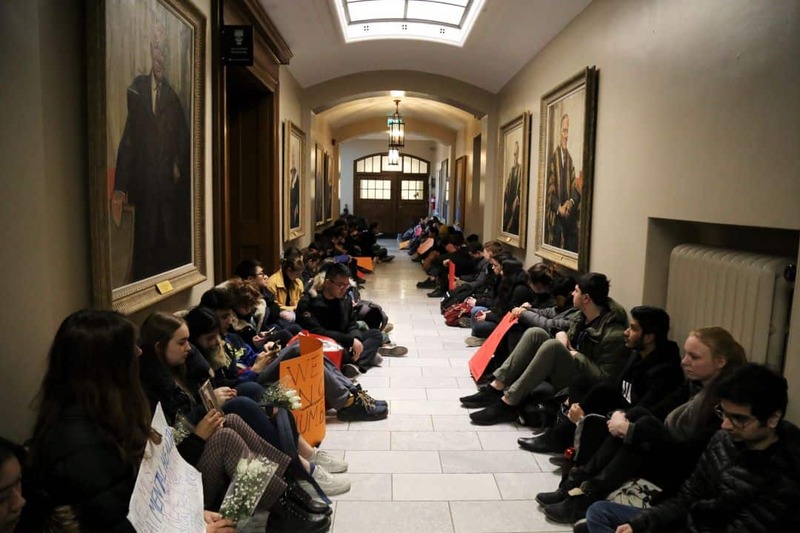 Joshua Grondin, Vice-President University Affairs of the University of Toronto Students’ Union, said that he raised the issue of emergency mental health supports on campus in a January meeting with the Office of the Vice-Provost Students. Grondin specifically suggested that a safety net or barrier be installed at Bahen and proposed that the university investigate implementing 24-hour counselling services at Robarts Library during the months of March and April.